Your dental treatment plan always includes X-rays when needed so your dentist can visualize your teeth, roots and bone structure. 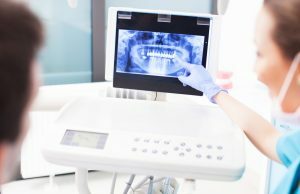 Modern dentistry offers digital X-rays for sharper, bigger images stored within the office computer system itself, requiring less office space and use of paper files. Award-winning OKC dentist Dr. Joe Isaacson uses these safe radiographs for accurate diagnoses and to explain to patients important aspects of their oral health care. Digital imaging truly has revolutionized today’s dental office. Condition of cosmetic treatments and restorations such as porcelain veneers, crowns, dentures, and bridgework–specifically, is decay developing around any of your dental work? Dr. Isaacson and his team take digital X-rays regularly, with yearly images being the norm. Some patients (smokers or people with gum disease) need them more frequently if they are receiving treatment for active oral health problems. Whatever views are needed, the dental assistant minimizes the tiny amount of radiation associated with modern digital X-rays. Special shielding on the front of the body and neck area protects both children and adults from any exposure. Most adults remember old-fashioned dental X-rays. The dental assistant had to develop the X-ray film the same way that photographers developed pictures. X-rays films were very small and hard to see, especially for the patient. Plus, films were stored in paper files along with patient charts. This took up a lot of room in the dental office. With digital X-rays, the process has changed. Images are recorded on the office computer. Both patient and doctor may review the X-rays so the individual can see and understand what treatment he or she needs. Additionally, these high-quality images are easily transferred to the primary care physician or dental specialist, such as an oral surgeon. Are Digital X-rays Really Safe? Today’s digital dental X-rays do not exposure our bodies to high levels of radiation. In fact, radiation is reduced by 80 to 90 percent over old-fashioned X-rays. Additionally, the individuals responsible for taking and developing these oral images do not have to use chemicals to “develop” the pictures. Instead, images are captured and stored in the dentist’s office computer system. These digital X-rays are eco-friendly as well, using less paper and not requiring office space to file and store. At Joe Isaacson Dental, digital X-rays tell the dental team valuable information about your oral health. They help Dr. Isaacson stay on top of current problems or discover issues sooner. Plus, because they are safe and clear, both patient and doctor can rest assured that they are an excellent diagnostic tool. For your routine check-up, please contact Joe Isaacson Dental today. Ask about our innovative X-rays!